Revised "Amity Street Horror" gets conditional approval from CB6 and, hey, we don't like to kick a developer when he keeps trying. Chumley's is disappearing before our eyes and I have no idea what it all means. The late great Revere Sugar refinery is now IKEA's overflow parking lot. More evidence nobody cares about landmarked buildings. The Armando's sign in Brooklyn Heights has been taken down. I wonder who got it, if anybody. "Construction is a dangerous business, and you will always have fatalities," Mr. Bloomberg said. "Two cranes collapsed in a short period of time — it looks like a pattern but there’s no reason to think there’s any real connection." No pattern? A rubber stamp on every proposed construction project since 2002, and there's no pattern? A political and economic blueprint that preaches "More building is better building," and no pattern? A Department of Building understaffed to address the onslaught of development, and no pattern? If you go around dropping banana peels around town and suddenly some people slip and fall on their backs, is there no pattern? There is a connection between the two accidents, Mr. Mayor, and it leades from the Developer-Construction Complex to the lax and corrupt DOB to City Hall to you. May a condo tower be approved for construction opposite your home on E. 79th Street and made a crane loom over your roof every day and every night. Then tell me all your thoughts on coincidence and chance. Weekend warriors have kicked off fútbol season in Red Hook Park, but the beloved food vendors who have ringed the sidelines for decades are stuck in a morass of red tape that could keep them out of business for another month at least. The bureaucratic snafu is a bitter irony for the vendors, who last year — for the first time ever — were required by the city to compete for the right to retain the locations they established almost 30 years ago. The first hint of warm weather typically accompanied the arrival of both soccer and the so-called “soccer tacos” to the Red Hook fields, but the vendors are still awaiting city approval of that concession contract and high-end vending carts that are now required. The vendors’ paperwork appears misplaced in the Kafkaesque municipal bureaucracy. Officials at the Parks Department said the vendors’ contract has cleared their review and is merely waiting for Comptroller Bill Thompson to sign off. But Thompson’s office said it has no record of it. Meanwhile, the purveyors of tacos, tortas and tamales need the go-ahead from the Health Department on a new fleet of mobile vending carts. A spokesman for that agency said the vendors haven’t presented their new carts for inspection. The city laid out these hoops for the vendors after announcing last year there would be an open bidding process for the Red Hook Park concession. The Health Department also nearly shut down the vendors, but were compelled to relent after an outpouring of support from foodies and elected officials, including Sen. Charles “Chimichanga Chuck” Schumer. Some vendors are so worried that this season will be lost entirely that they’ve set up stands at the Brooklyn Flea, a weekly outdoor market in Fort Greene. So I have to trudge to Fort Greene now? Well, I suppose the extra biking will work off the calories from the pupusas. Another crane has collapsed in Manhattan, this one on East 91st Street. It smashed into "a high-rise apartment building on East 91st Street on the Upper East Side on Friday morning, tearing off balconies and leaving a swath of damage... One person, the operator of the crane’s cab, was killed and at least one other has been pulled from the wreckage, but that person’s condition was not immediately known." That must have been one of those cranes the Department of Building inspected just a while ago after the horrific East Side crane crash in March. Wonder if Bloomberg will react with his usual "accidents will happen" speech this time, or finally realize that rampant, largely unsupervised construction comes with serious consequences. I don't care for donuts. But if you must eat donuts, these are the best in New York by my judge. Everything's homemade in this Greenpoint landmark. I had one with apple filling that was fairly amazing. Nothing processed about it. Great sign and classic coffee shop interior to boot. That's what the hodgepodge of connected buildings at the corner of Hicks and Congress is now, following in the tracks of the former structure at Columbia and Warren. That only leaves the Hamburger Christmas display factory at Warren and Hicks for L&H Equities to destroy before its Condo Time in Cobble Hill West. These guys are in a hurry. There are few things to cheer oneself with when an piece of gritty New York history is torn down to make way for some plain-Jane newbie condo complex. But one frequent fringe benefit keeps cropping up on a regular basis: the uncovering of old signs and ads. 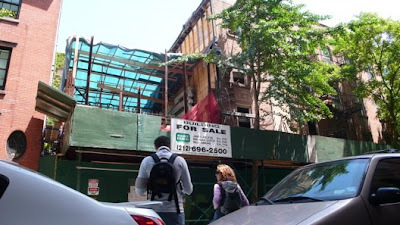 I have written recently about L&M Equities' speedy tear-down of the building at the corner of Columbia and Warren in Cobble Hill West. Well, it's all gone know. But feeling the sun for the first time in half a century or more is an old advertisement by that onetime king of outdoor signage, the O.J. Gude Company. The sign's pretty smudged, but based on the discernible slogan, "The Flavor Lasts," and the dominant color of green, it was once an ad for Wrigley's gum. I find it highly amusing that, while the ad has faded plenty, the name of the company that painted it is still completely legible. 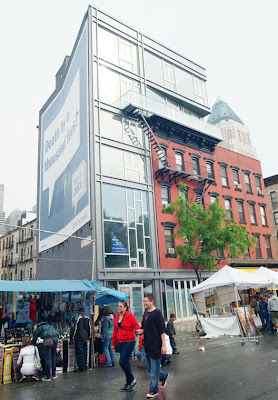 View it on Ninth Avenue in Hell's Kitchen and give up all hope. This address, 451 Henry Street, is the other Cobble Hill building owned by Arlene Karlsen, the keeper of the infamous Rat Squirrel House at 149 Kane Street, lately in the news for being a future heap-of-bricks and general eyesore and menace to society. I'd been told Karlsen had another building in the area for some time, but only located it yesterday. In marked different to the Rat Squirrel House (below), it looks to be in fairly good repair. There are some worrisome hairline cracks in the facade, but nothing like the decay at 149 Kane. There are also no serious DOB violations against the place. There is, however, a Kerry-Edwards bumper sticker in the window that really needs to come down. George and Ted Jumes were Greeks; George came over to America when he was merely 14. Their first Sheboygan restaurant was called the Coney Island Restaurant, for some reason. It was renamed Jumes when it moved in 1951 to its present location. As far as I can tell, the second generation of the family is still in charge now. The menu is pretty standard. And yes, they serve bratwurst. Also, uh, homemade dog treats, at $1.50 a bag. One of the hallmarks of small city living, I've become convinced, is an unwillingness to throw away old vacuum cleaners. These frugal folk do not rush for the nearest Target when the dust-sucker goes on the blink. They bring the appliance to the vacuum repair shop. "The what, now?" you ask. You heard me right. The vacuum repair shop. Such stores are difficult to locate in Gotham, where a malfunctioning vacuum is a dead vacuum. Like most sorts of repair places, they've gone the way of the Dodo in this disposable society. But not in Wisconsin, where you'll find a vacuum repair dude not just in every small city, but smack dab on the Main Street. The one about is in Sturgeon Bay. Below is a shop in Algoma. And far below one in Two Rivers. None of these cities has a population over 15,000. And yet there are enough vacuum owners to support these businessman. It's rather awe-inspiring. I've passed by the set-back, four-story, red-brick building at 238 President Street in Carroll Gardens many times and admired it as a fine, understated piece of architecture and a nice variation from the usual brownstones in the area. But only recently did I realize that the black, cast-iron, filigreed gate that stands as the property's entrance is festooned with equally black, cast iron letters. They're hard to see. Many have fallen off over the years. And the coming of spring, causing the entwined vines on the gate to sprout leave, make it even more difficult to discern what words the letters formed. I must have stood there looking at the gate for ten minutes. But I finally figured out it once said "Faculty Home of the Methodist Episcopal Church." The Simpson Methodist Episcopal Church, to be exact, on the corner of Willoughby and Clermont Avenue. This structure—quite a distance from the church—was erected in 1897, the gift of one Mrs. Hans Christian as a memorial to her dead husband. It was also called the Deaconess Home. Tragedy struck on Sept. 7, 1916, when its 18-year-old kindergarten teacher, Dorothy Langhaar, daughter of a Wall Street broker, was drowned. Don't know when the church gave up the building. At P.J. Clarke's, the iconic bar in the east 50s in Manhattan, once you walk past the main bar into the initial dining area, there are two hidden alcoves, one to the right and one to the left. There's a table and a few chairs inside each, obscured from view. I've mentioned these rooms before as perfect niches for clandestine meetings or trysts. What I hadn't noticed before was a little speakeasy-like, peek-a-boo window connecting the southern room to the the barroom. Perfect for a patron beckoning a waitress or bartender's attention, or for a waitress to pass through a plate or drink, or for a fella to keep an eye out for any arriving enemies. I am sad to see that the return of the beloved Red Hook Ballfield Vendors—rumored to be set for Memorial Day weekend—did not occur as, uh, rumored. The good: Several vendors will be operating satellite stands at the Brooklyn Flea (market) in addition to Red Hook. Starting this Sunday (May 25th), the Vaquero, Hernandez and Soler stands will be selling elotes preparados, huaraches, pupusas, and etceteras. So get your fix here until Red Hook is up and running. The City. The freakin' City. They just have it in for these poor people. Signs of New York's long timeline can be found most anywhere. We pass them by everyday, and mostly we don't notice. I was recently struck by this loading dock in Tribeca. Not the bricks or the roller-shutters, but the lip of the dock, which is composed of long, bare, gnarled logs of untold age. They look prehistoric to me, and we set in place decades ago by some huge piece of metal (large nails, hooks, spikes, I'm not sure). Come hell or high water, I'm betting they'll still be here. As much as I am a New York City person, I get a certain shiver of excitement when I go on a trip that I know will cause me to pass through a mid-to-small-sized city—the kind of city that was founded 100 to 150 years ago and was once driven by a significant industry of two, since died away. Because such cities have not thrived as centers of commerce for 40 or 50 years, they tend to sit in a state of suspended animation. Their main streets and downtown retain the architecture and cultural flavor they have in the early 20th century. Thus, these cities are goldmines of Americana. Wisconsin is a state replete with such cities. Beloit. Lacrosse. Eau Claire. Fond du Lac. Oshkosh. Green Bay. Etc., etc. Another in Manitowoc, a former shipbuilding center that sits on the shore of Lake Michigan, about an hour and a half north of Milwaukee. Driving down the main drag of North 8th Street, you'll pass a little storefront with a red-and-white-striped awning. This is Beerntsen's, a candy shop and luncheonette that's been here since 1932. Inside, time has not touched this place. The dark wood counters and cabinets are as they were. So is the back room of wooden booths, festooned with coat hooks, sconces and mirrors. A clock hangs from an archway separating the two sections of the store. Ceiling fans twirl. I bought some chocolate and had dinner here. The help consists of young blonde girls who are Wisconsin-nice and placid. The menu is a shocker. Of the various sandwich selections, I don't think a single item was over $5. I did a triple take. My "bratwurst plate" (bratwurst, potato salad, chips, pickle) was $4.95. You can also order phosphates of all flavors. The place was founded by Joe Beerntsen. He learned his trade in nearby Green Bay, undergoing a four-year apprenticeship at the Brenner Candy Company. He then opened a series of candy shops in a set of increasingly smaller cities: first Chicago, then Milwaukee, then finally Manitowoc, where he stayed. Three generations of Beerntsens ran the place until 200e, when new owners Dean and Chrissy Schadrie took over. Dean grew up making chocolates in another local family business, Pine River Pre-Pack, Inc of Newton, Wisconsin. 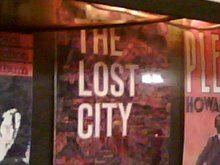 Lost City Asks "Who Goes to Queen Restaurant?" 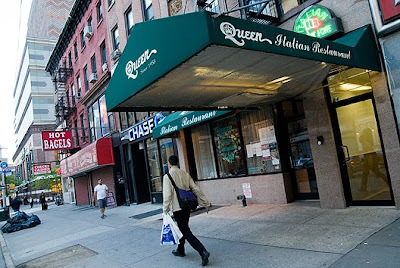 I took a trip to Queen Restaurant for my most recent "Who Goes There?" column on Eater.com. 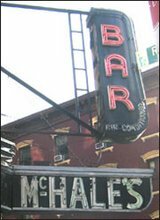 It's a place I've passed by a hundred times on my way to the subway or downtown Brooklyn, but never gone in. Partly because it was near a McDonald's (don't underestimate the power of guilt by association, where restaurants are concerned); partly because the shutters were often closed, discouraging inspection; partly because it kinda looked like a diner. It had the best food of any of the "Who Goes There?" restaurants I've tried so far. It was also the most pricey. And also the most ugly. I'd love to advise them on a redo of the interior. I swear their business would skyrocket. But, then, I guess the place just wouldn't be the same. At the edge of the Battery Park playground near the Staten Island Ferry Terminal, fenced in near a small Parks building, are two sad marble monuments that were some time ago uprooted from their natural resting places. They are now encircled by a chain-link fence and hundreds of stacked chairs. One is very clearly a monument to Coast Guard members who served during World War II. The second is harder to decipher. Many chairs block the English inscription on one side, but the Italian writing on another side is clearly visible. It seems to be in honor of the explorer Giovanni Da Verrazzano, the man who gave his name to our bridge. There are news records of a Verrazzano monument being dedicated in Battery Park in 1909, and that is the date on the stone. A torso-up sculpture of the explorer, created by Ettore Ximenes, once sat on top of the stone. It was apparently removed from its place where the Liberty Island boats are launched sometime in the 1930s, and then stored. When its existence was rediscovered, it was brought into the light again and placed once more in Battery Park. The Parks Department currently shows a picture of the monument in its former place with no explanation as to why it's be displaced. It also shows the Coast Guard monument in its former location, near the Southern entrance path to the park. It was dedicated in 1955 and also once had a statue atop the stone. This , however, contains an explanation: "The memorial has been temporarily placed in storage to accommodate the redesign of Battery Park and the construction of the South Ferry subway station, and will be placed on Heroes Walk at State and Pearl Streets near the Coast Guard Building. It is anticipated that this work will take place around 2009." It's one thing to temporarily place unnecessary or inconvenient statues in monuments in warehouses for a time. It's another thing to let them sit out in the open among chairs and junk, so the public can readily witness how little the Park Department thinks of them. Can it be possible? Some anonymous rich guy stepped up with $20 mil and saved St. Brigid's. Hey rich guy! Call me! I know some other places worth saving. Behold the Toyota Children’s Learning Garden of the East Village. The name says it all. Macy's wants to rename 34th Street between Sixth and Broadway R.H. Macy Way, after founder Rowland Hussey Macy. What about Isador and Nathan Strauss, who were partners with Macy from 1888 and who bought Macy's from R.H. in 1896, and actually moved it to 34th Street? Frank Bruni writes lots and lots about Florent. Landmarks Commission nixes awful garage plan for Brooklyn Heights Riverside Apartments. ...When the cynical young keyboard-tappers at Gawker think the City is changing too fast and losing too many of its great places. 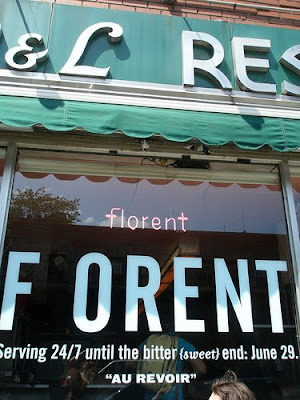 Reporter Sheila McClear today wrote that the Gawker staff was "riled" today at finding our Florent's days were numbered. She then put together a death list of passed or passing monuments, including CBGBs, Astroland, the Fulton Fish Market and, uh, the Playpen. Usually when the moans arise over the disappearance of some old bar or club, Gotham's 20-somethings tell the bitchin' old folks to clam up and move to Nebraska. When urban greenhorns begin to feel nostalgic, you really know something's deeply wrong with the direction in which NYC is headed. Shocking Rat-Squirrel House News: Backyard Is Even Worse! In my months of observing the Rat-Squirrel House on Kane Street in Cobble Hill, I've never once met or seen its slippery mysterious owner, let alone gained access to the interior. But the blogger at Musing on 'Point—a Greenpoint-based blog—has succeeded where I haven't. Not in photos of the inside, no, but with pictures of the backyard of 149 Kane Street, which—God help us all!—is possibly in worse shape than the front. Meanwhile, I'd like to report that the pigeon that was previously making himself at home on the stoop, under the scaffolding, has successfully moved in, using the same upstairs window (still open after all these months) the rats and squirrels do. The Staten Island Ferry Terminal has a real aesthetic going and I can sum it up in two words: Big Letters. If you can't find a phone or the bathroom or learn the time at this cavernous hall, you're not very observant. It's a pretty stylish look, actually, in a sort of obvious way. There is one truly wonderful aspect to the building. They've reproduced in titanic print the opening lines of Edna St. Vincent Millay's classic poem "Recuerdo": "We were very tired, we were very merry­/ We had gone back and forth all night on the ferry." It's surprising that somebody thought to give poetry such play in this heartless town. I was crossing the public plaza outside 909 Third Avenue in the mid-50s when I spotted this peculiar plaque embedded in the ground: "Private property. Permission to cross revocable at will." Huh? What gives? Has absolute power corrupted absolutely at ol' 909? The real reason for those markers, which you characterize as "snide," has nothing to do with the preservation of "corporate calm" or the exclusion of vagrants and criminals, as you assert. Putting the world on notice that crossing is by revocable permission is a simple necessity to insure that the ancient doctrine of adverse possession doesn't rob the landowner of his land. Under a legal principle we inherited from pre-Revolutionary English law, open use of land without permission and against the interests of the landowner can gain the user actual ownership of the land after 10 years. By placing the little bronze markers where pedestrians walk, the owners of the private property adjoining the sidewalks confirm that they don't intend to cede that land to the public. The Fulton Street Transit Center? The Freedom Tower? The Calatrava PATH station hub? Un-uh. Somebody take down this embarrassing sign outside Battery Park. "No Matter Where You Travel Someone's Heard of Defonte's"
Yesterday I was at Defonte's, the Red Hook sandwich shop and one of the last vestiges of the old waterfront culture, hooking up with an egg sandwich (which they do, and aren't nearly as expensive as their meat-laden creations). The wall opposite the counter is filled will framed pictures, some of celebrities, a few family shots from the old days depicting the DeFonte sons as young men. In one corner, I noticed a picture of an old Defonte's ad. Jeez, I thought, did Defonte's ever advertise? It's always been a word-of-mouth place for as long as I can remember. The ad is pretty hilarious. I place it sometime in the early '70s due to the phrase "I can believe he'll eat the whole thing! "—a take-off on the classic 1970s Alka-Seltzer line "I can't believe I ate the whole thing." But the best line is the last one: "No Matter Where You Travel Someone's Heard of Defonte's." C'mon guys. Even Queens? Room for a New Big Box on Smith Street? Eat Your Heart Out, Robert Downey Jr.